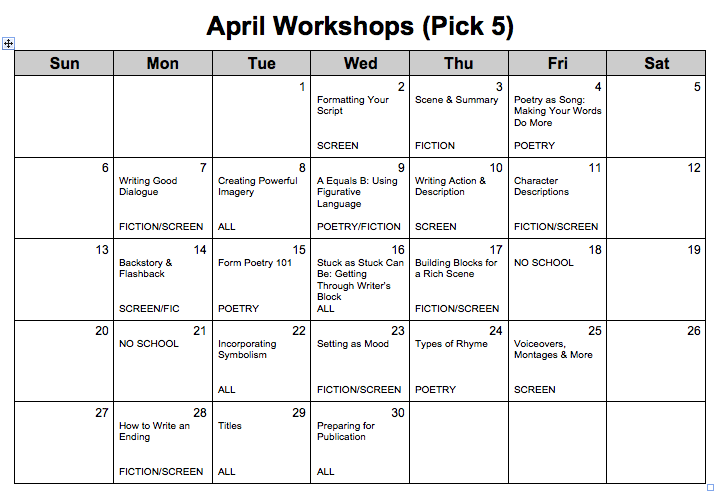 In April, in Creative Writing, we’ve taken a detour from technique-driven units of study. 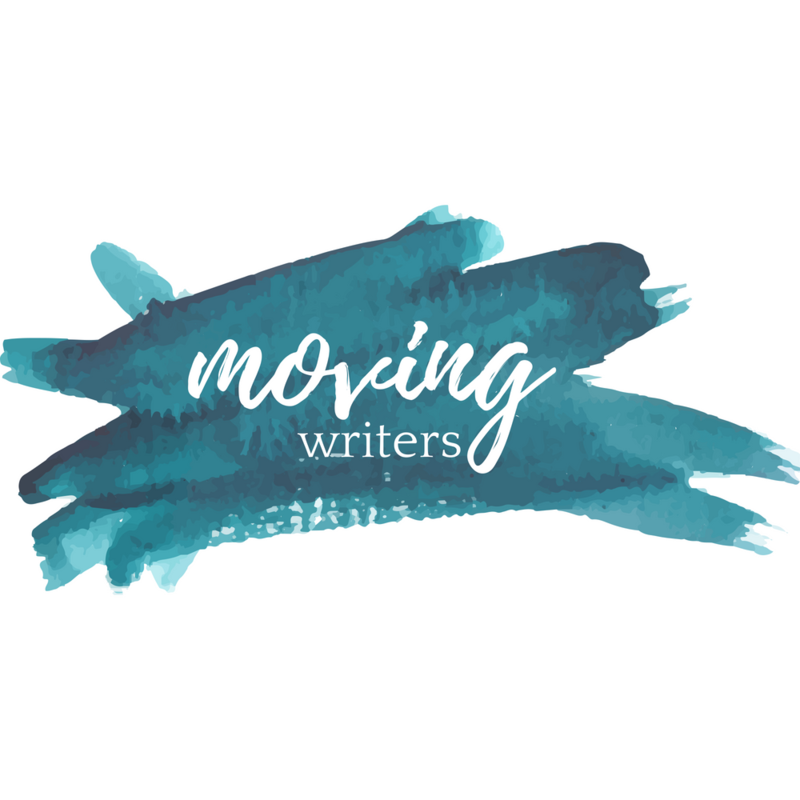 Students are participating in a National Novel Writing Month-inspired challenge, choosing from one of the following writing projects: 30 poems in 30 days, a novel (10,000 words minimum), a screenplay (45 pages minimum). As the weather turns from winter to spring, everyone welcomes this opportunity to go where the wind takes them. How can I best support these writers while giving them the freedom and time they need to create? How can I tailor this experience to individual writers while disseminating information about genres that many writers need? Rather than planning a month of whole-group mini-lessons, I created a rich menu of lessons from which students could choose. Some of the mini-lessons cross over two or sometimes all three genres. Others are specific to one genre. But all students are invited to attend any mini-lesson. They know that experimenting outside of one’s “home” genre can often lead to the most creative work, so this week, for example, a few poets attended my lesson on character descriptions. On most days, four or five students attend the lesson. Sometimes, one or two students are present. During the lessons, we get creative and push unoccupied desks and chairs together at the far end of the room–far enough away from other students to establish a small learning community, but not so far enough that non-attendees can’t eavesdrop if they want to! At the beginning of the week, I talk a little bit about each mini-lesson so students can plan ahead. I tell them to put a checkmark or star next to the lesson(s) they plan to attend. On Mondays, we meet in genre-based writing groups for 10 minutes to share, reflect, troubleshoot, exchange feedback on drafts. On Fridays, we share 1-2 minute excerpts in the author’s chair at the front of the room (I split the 13-student class into two groups, with 6-7 students reading each Friday). During the week, students can also conference individually with me. To keep a record of their attendance at mini-lessons, and to keep their work goal-driven, I ask students to submit a weekly log in which they summarize what they have accomplished throughout the week, share feedback on the mini-lessons, and plan for the following week. When students are not attending a mini-lesson, they are conferring with me, with one another, or simply working on their projects. As a bonus, I have been able to bring in our religious studies teacher, whose hobby is writing, to teach some of the mini-lessons. He is currently transcribing an autobiographical screenplay into a novel. Guest writers breathe new life into the curriculum. Teacher guests allow students to see that we teachers are more than our teaching. Next to one-on-one conferences, offering choice allows for ultimate differentiation. On end-of-the unit reflections, when I ask students which mini-lessons were the most and least helpful, sometimes students say, “This mini-lesson was the least helpful because I already knew how to punctuate compound sentences.” Students who are already familiar with the content of a mini-lesson can opt out; those who need more guidance can attend. Students who are doing particularly strong work in a specific genre or with a specific technique could be asked to lead or co-lead a mini-lesson. The menu gives students more options during workshop time. In the past, students who are suffering from writer’s block or are having an “off”day during workshop may choose to waste time. Instead, they can choose to attend a mini-lesson in hopes of gaining much-needed inspiration or direction. By the end of the year, students should have a better idea of what they need as writers. Allowing them to choose the support they receive fosters independence and feels more authentic and differentiated than whole-group mini-lessons. Do you offer small-group mini-lessons or conferences? How do they work logistically? How do you plan for them?